Coldspeed Logistics is the leading supplier for cold chain transportation in Pune. We have the latest technology and a new fleet. Call us for all your cold chain logistics requirement. We transport the temperature sensitive products across India. 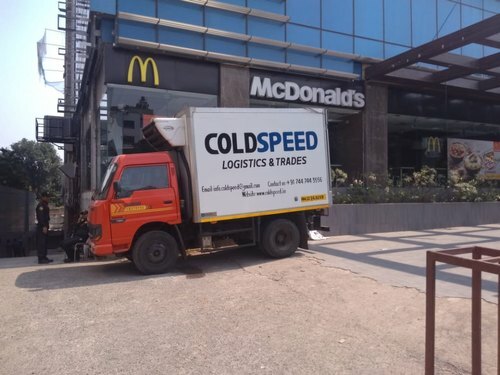 Established in the year 2012 in Maharashtra, India, we “Coldspeed Logistics And Trades Pvt. Ltd” is a Private Limited company based in Pune-Maharashtra, involved in the cold chain logistics services and much more. Our services are getting widely acclaimed among the large clientele for our up to date and efficient service. Apart from this, our ability to maintain timelines as well as quality in the assortment, providing cost-effective solutions and assurance to make timely shipment of the orders placed by customers have assisted us positioning our name in the list of top-notch companies of the industry. 2) Modern fleet, with an average age of ~1.5 years. 3) Varied vehicle sizes, capable of carrying a load of 700Kg to 6 MT. 4) Multiple temperature capabilities (+25 to -25 degree Celsius). 5) Latest technology of GPS and data loggers, enabling 24/7 online vehicle and temperature tracking. 6) Imported refrigeration units (Carrier & Thermo-king), thus assuring quality and international standards. 7) ISO approved PUF insulated body of 125mm, 38kg density. Aluminum rail channels inside the body for proper air circulation. Strip curtain provided at the rear to prevent air escape. 8) FSSAI and FDA certified vehicles.